As UDMN projects reach their business – led innovation goal, it is important to celebrate these projects and the Network Members who have excelled within the past year. 1. The Outstanding Achievement in Commercialization award is given to a proponent who has taken their UDMN commercially viable project to completion and made a commercial sale/s creating a new innovative product to market place that can be implemented in mining operations and beyond. This award represents the commercial win of a “game changing” technology, excellence and innovation to the mining industry in Canada. 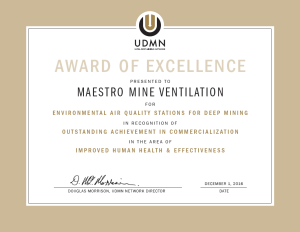 The award goes to Maestro Mine Ventilation for the project titled Environmental Air Quality Stations for Deep Mining under theme 4: Improved Human Health & Effectiveness. 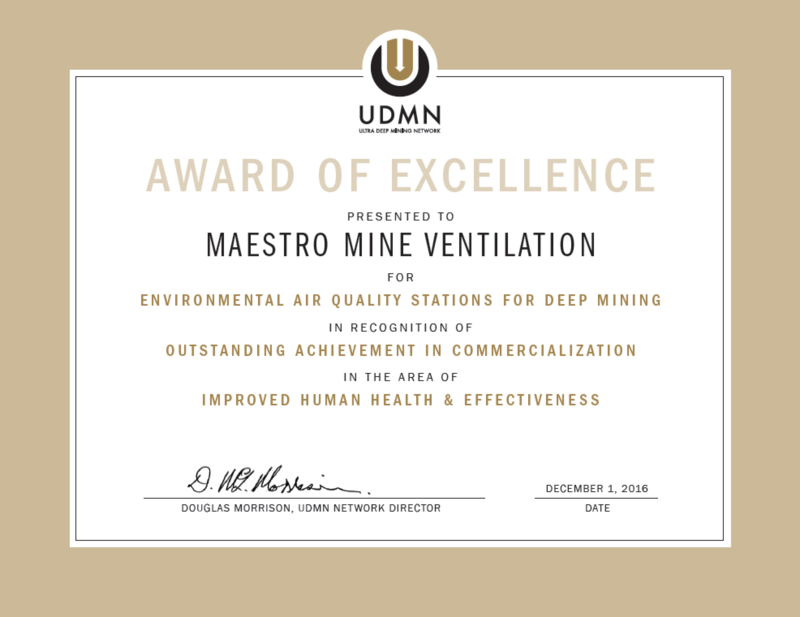 Maestro Mine Ventilation is the recipient of first commercialization award for a technical innovation which ensures the safety of underground miners. Underground mines have challenging environmental conditions that include toxic gases from the drill & blast operation or gases given off by the surrounding strata rock. Protecting miners from acute or chronic gas related health conditions is paramount for any responsible mining company. To achieve this, a variety of sensors are required to transmit real time data from the underground workings to the surface control rooms. By using this technology, miners are able to return safely to their working areas quicker allowing significant productivity increases. However, these sensors require frequent maintenance and calibration in order to maintain accurate measurements. The previous technology required underground calibrations at each individual location using test gases however several physical and environmental challenges prevented an accurate and repeatable calibration. Maestro has tackled this real-life application by designing and developing a digital gas sensor that can be calibrated on surface in a stable controlled environment. The digital sensors then can be “hot swapped” by a ventilation technician without the requirement of any sort of underground calibration. Built upon the IoT (Internet of Things), the digital sensors have a complete suite of diagnostics to help determine the health of the complete system and provide maximum system uptime. The rapid commercial sale of this product to some of the deepest mines in the world is a testament that Maestro’s efforts combined with UDMN funding and guidance can in fact bring technology quicker to market which in turn benefits the mining industry and Canadians. This project is an ideal example of what UDMN is delivering for Canada. 2. 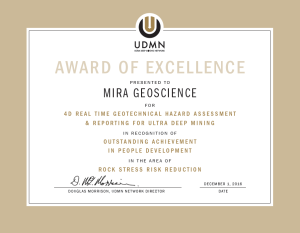 The Outstanding Achievement in Collaboration award is given to a project proponent who has demonstrated an ability to work collaboratively with other companies and organizations to achieve mutually beneficial goals, overcome challenges together, support for team members through consensual decision making, and the ability to maintain and build strong working relationships while meeting the objectives of the ultra deep mining network. 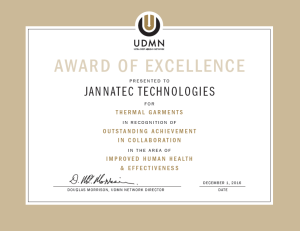 The award goes to Jannatec Technologies for the project titled Thermal Garments under theme 4: Improved Human Health & Effectiveness. Jannatec is developing an integrated solution for personal protective equipment that integrates active assisted thermoregulation system of the miner with environmental and physiological sensors. Jannatec needed to design a new kind of coverall, one that could compliment the integrated thermal management system, meet safety standards and designed from the ground up with thermal comfort in mind. So Jannatec partnered with researchers from the George Brown College’s School of Fashion Studies and the Olds College Apparel Innovation Centre to develop innovative work wear for ultra-deep mining employees. 3. The Outstanding Achievement in People Development award is given to a project proponent who has increased the capacity of its company by hiring highly skilled people that enrich the company’s ability to perform by creating a dynamic, talented and integrated team. Through strong leadership and business development and succession planning and talent development this proponent has capitalized on being a member in the ultra deep mining network and become an employer of choice within the mining sector in Canada. 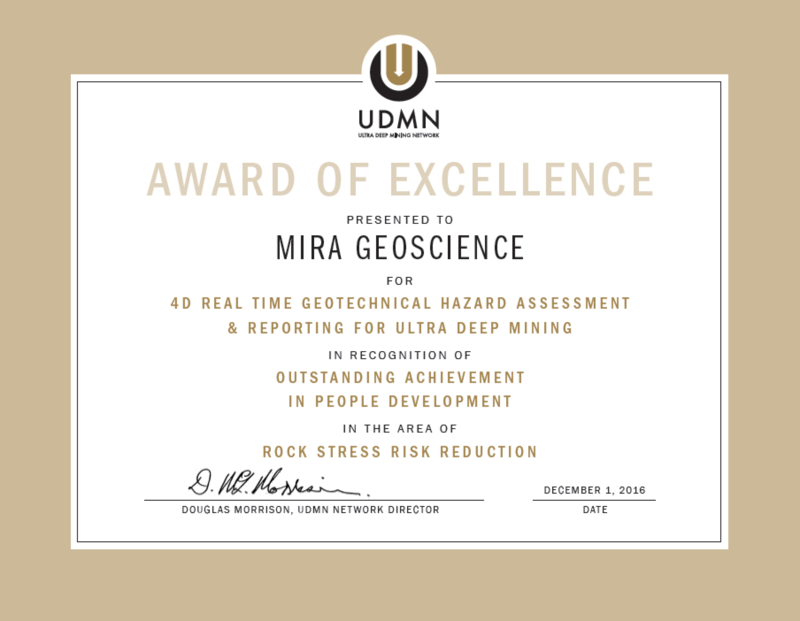 The award goes to Mira GeoScience for the project titled 4D Real Time Geotechnical Hazard Assessment and Reporting for Ultra Deep Mining under theme 1: Rock Stress Risk Reduction. Geoscience INTEGRATOR created by Mira GeoScience was originally conceived to accommodate the data management needs of SUMIT, a multi-disciplinary, collaborative research programme involving academic institutions, mining companies, SMEs and managed through CEMI. Within Mira’s involvement in the follow-on “Mining Observatory Data Control Centre” (MODCC) project, exploration data themes and a powerful 3D visualization and query interface were added. Geoscience INTEGRATOR is now a UDMN project that supports, tracks, and automatically reports on 4D dynamic mine models (a new feature) and associated geohazards. Mira Geoscience is a company which continues to grow as an innovator and as a top employer in the mining sector. Of note is that since January of 2015, it has increased its employee level from 35 to 55: a 57% increase. Currently another 5 positions are waiting to be filled, which will increase the company workforce to 60 personnel. The UDMN looks forward to acknowledging and awarding many more network members over the coming year. Our network is strengthened by its members and these awards are an acknowledgment of the value members bring to the network, the mining industry and the innovation agenda in Canada.